Greetings my fellow Kruse Cougars, my name is Monty King and I am honored to be the Computer Science teacher at this amazing school. I have been instructing and empowering students for over 10 years as a computer science teacher in Florida, Texas and now in the beautiful state of Colorado. I moved here about 8 years ago seeking a place that could appease my adventurous nature and keep me entertained with the great outdoors and what better place to do that then the amazing state of Colorado. 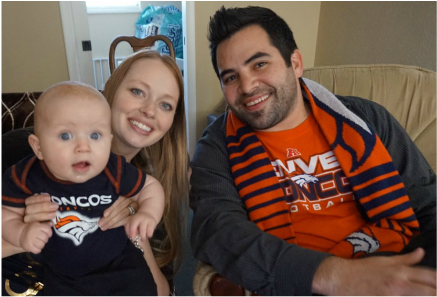 As you can tell from the picture my family and I are HUGE Broncos fans and my King crew consists of my beautiful wife Megan (aka Megatron) and the newest member of our crew is lil Daxton (aka Daxtonator or Super Pooper). Lil Daxton was born August 31st right here in Fort Collins and he is the coolest super kid I know and his mom and I love finding new adventures for him to find. You can stay caught up on all the latest events with Daxton's hashtag, #DaxtonKing. When I'm not hanging out in the computer lab I enjoy our great outdoors like hiking, biking, snowshoeing, snowboarding, Colorado'ing (yes it is a thing) and finding grand adventures wherever I go. I am extremely excited about being the students leader when it comes to the latest and greatest in computer science as well as bringing them the latest news and trends in EdTech. If you ever have suggestions or questions please feel free to stop by the computer lab or send me an email, montyk@psdschools.org. Now let's get this computer science party started!! !